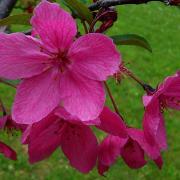 very often expressing the first blooms of Spring. 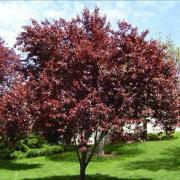 Bright pinkish-red blooms in spring with dark purple red foliage. Orange Fall foliage. Grows to 16 ft.. Very disease resistant. 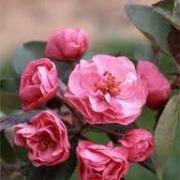 Fragrant, double, rose-pink blooms in spring with green/red foliage. Grows to 18 ft. Very disease resistant. 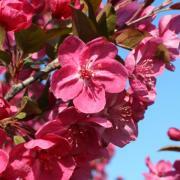 Spectacular deep pinkish-red spring blooms with purple foliage fading to bronze. Maroon berry-sized fruit fall/winter. Grows 20 ft. Disease resistant. 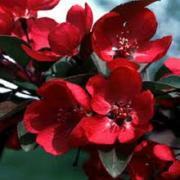 Striking red-magenta blooms in spring with attractive green/red foliage. Very showy fall color with bright red berries fall/winter. Grows 18 ft. Disease resistant. 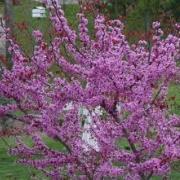 Beautiful lavender/pink/purple spring blooms with rich purple foliage. Grows to 20 ft. Excellent understory tree. 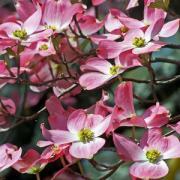 Lovely rosy pink blooms in spring with red/purple new leaves changing to dark green. 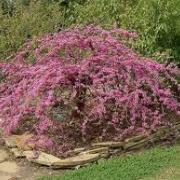 Grows to 25 ft. forming a spreading, graceful crown. 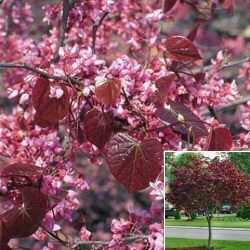 A weeping redbud with vibrant pink blooms in spring followed by dark glossy leaves. Graceful arching branches that give a cascading effect. Grows 6 ft tall and 12 ft wide. Showy flowers in spring followed by red-purple fall color. Glossy red fruits atracts winter songbirds. This understory tree requires moist well-drained soil. Biscuit-shaped flowers grace this low branching speciman tree. Berries are glossy red and attractive to wildlife. 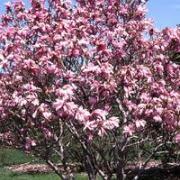 Prefers partial shade, moist, well-drained soil. Lovely focal point with light pink flowers early spring followed by violet-red leaves all season. Grows fast to 25 ft. Fuzzy pink summer blooms are attractive to butterflies and birds alike. 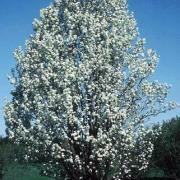 Grows fast to 30 ft.
Abundance of white blooms in spring form on an upright,, evenly-branched cone shaped tree. Brilliant purple to orange-red fall color. Very fast to 30 ft. The first TRUE RED introduced on the market. It's gorgeous display of large blooms extend into September. Very poplular. 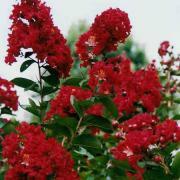 Grows to 15 ft. Look at more selections under crape myrtle availability. 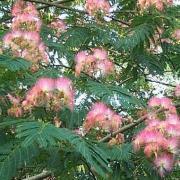 Silky buds form in winter followed by large, showy flowers emerging dramatically in early spring. Grows to 15 ft. 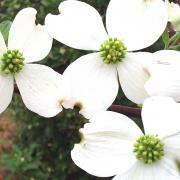 This tree gets smothered in stunning fragrant white star-shaped flowers in early spring. 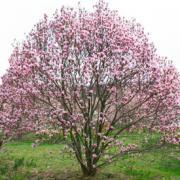 Grows to 12 ft.
Gorgeous tulip shaped blooms with reddish purple color opening to white in early spring. Slightly fragrant. Grows to 10 ft.
White, feathery flowers in late spring. 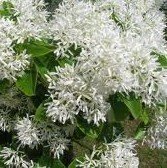 Blooms emit a sweet lilac scent, especially in evening. 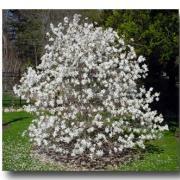 Grows to 25 ft. Also know as Fringe Tree. 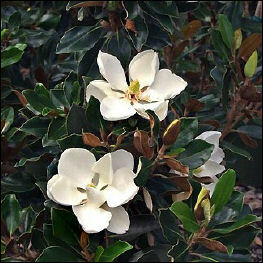 Produces large fragrant creamy white saucer blooms. Leaves are deep glossy green on top with a bronze-brown fuzzy underside. Grows 15-20 ft. 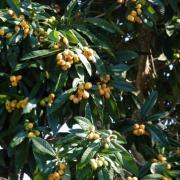 This Japanes Plum is an evergreen with large, stiff leaves. It gives a tropical look in the landscape. Very symmetrical, with edible yellow fruit further south.